John Church Principal Research Scientist from CSIRO Marine and Atmospheric Research, received the CSIRO Fellow Award in 2010. He was elected fellow of the Australian Academy of Technological Sciences and Engineering in 2004 and the Australian Academy of Science in 2012. He won in 2006 a CSIRO Medal for Research Achievement. If you know more about John Church and you want to contribute, please contact us. 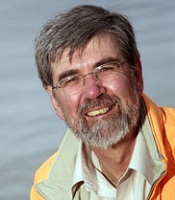 CSIRO Fellow, Dr John Church.